If your dog or cat has pancreatitis, diabetes, PLE or elevated liver enzymes, it is essential that you give your pet special enzymes that help break down protein and fat while increasing absorption of nutrients. Pets with these health conditions, especially, must be on an enzyme that helps them digest their food. Cats and dogs with pancreatitis are very sensitive to fats in their diet. Using the Lypozyme enables them to eat a reasonable amount of fat without discomfort. Symptoms of poor digestion related to fat absorption can include gas, bloating, swollen abdomen and elevated pancreatitic enzymes. 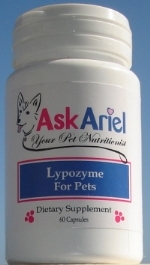 Lypozyme for Pets is a a veterinary-approved, easy-to-use digestive enzyme that is well tolerated by cats and dogs. Great for even tiny pets. The powdered contents in the pill can be sprinkled directly into the foods and pets don't seem to notice the taste. This is a must for pets with pancreatitis, diabetes and elevated liver enzymes.